2016 GOP Primaries: Manifestation of the fringe or recycling the past? | Progress Matters. 2016 GOP Primaries: Manifestation of the fringe or recycling the past? Foreword: This piece is entirely my opinion. I dual majored in Political Science and Computer Science, and completed my Senior Seminar class + paper on Southern Politics. I can’t help but draw parallels between the nature of the current GOP primary races and elements of traditional Southern politics back in the days of Democrat dominance in the South. It’s something I constantly find myself having to remember, but the political structures are not that far removed from realignment, so this shouldn’t come as too much of a surprise. Yet watching the debates, campaign subject matter, as well as how candidates speak to and of each other really pushed me to offer some reasoning from our past. First and foremost, the issue of realignment. I feel that studying realignment is crucial to understanding how and at what rate electoral blocks in the South transitioned from Democrat to Republican. From the end of Reconstruction in the South to the Presidency of FDR, Democrats held a near monopoly at every level of political power. Yet, with some inclusion policies in government positions pushing equality introduced by FDR and Truman, the Democrat hold on the South started to splinter. 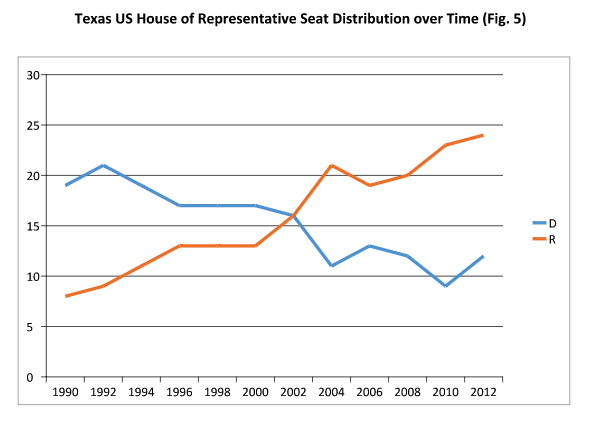 Graph of Democrat vs Republican seat totals in Texas showing realignment. This came to a head of sorts in 1948 when Southern Democrats, called Dixiecrats, staged a walkout at the Democratic Convention to protest anti-segregationist policies that were quickly being adopted as part of the national platform. The fallout really accelerated in 1964, when LBJ signed the Civil Rights Act of 1964. As he signed it, he famously remarked, “I’ve lost the South for a generation.” As it turns out, it’s been even longer. Looking at Southern voting data from Presidential, State, and Local elections, a pattern of shifts appears quickly at the Presidential level from Democrat to Republican, and slower at State and Local levels. The deal was sealed in 1980, when Ronald Reagan visited Philadelphia, Mississippi, a location grimly known for the 1964 murders of 3 civil rights activists advocating for the rights of African Americans. Reagan delivered a message of States rights that resonated strongly with a Southern electorate that had felt disenfranchised and unrepresented from the national Democratic party. Finally, Southerners had found their party. Understanding the transition from Democrat to Republican, now let’s take a look at understanding just how Democratic candidates were able to be elected in near monopoly conditions. In reality, the Democratic primary was the real election as there hardly was a Republican challenger that was relevant. Additionally, the South has a unique quality to it where it is more rural, and often different regions of a state had their own “candidate” that they would all advocate for, leading commonly to situations where 5 candidates would each receive roughly equivalent votes based on regional affiliation. One way to rise above the fray, as noted by renowned political scientist V.O. Key Jr in his famous work “Southern Politics in State and Nation,” was for candidates to say absurd, fear-mongering statements in order to shock people into giving their support. In practice, making noise was more important than substance in order to stand out in a primary field featuring a multitude of candidates. Why does this matter? I can’t help but feel that the politics and methods of old Southern Democrats, whom have since realigned to the Republican party, are rearing their somewhat ugly head once again. Looking at the 2016 candidates, you have many who come from different parts of the South (such as Cruz, Jindal, Bush and Huckabee among others), and a field that hasn’t accomplished a lot of separation. Additionally, and perhaps because of this, the campaign narratives and debates have often featured personal attacks between candidates as well as fear-mongering / demonization of a group of people in order to advance a candidates stature. We’ve seen the demonization of the religion of Islam, Muslim people, Mexican immigrants, as well as the propagation of myths such as Sharia-law based “no-go” zones emerging across the United States. We’ve also seen personal attacks between candidates on personal history and appearance. Thus, while many are quick to chalk up this madness as an anomaly election, I can’t help but offer the opinion that this is the return of politics that are well rooted in some of the darkest days of our democracy. “Southern Politics in State and Nation” by V.O. Key Jr.
“Racial Attitudes and the New South” by James H. Kuklinski, Michael D. Cobb, Martin Gilens.